Is it okay to use part of a movie to describe the movie? I found The Amazing Spider-Man 2 (TASM2) to be quite amazing. I went with the right crowd early Thursday evening: my eldest niece and nephew, and a theater with maybe 2/3 full of fanboys. In fact, there was a fairly muscularly fit dude sitting in front of me with a super tight Spider-Man t-shirt… or muscle shirt? Maybe it was part of the actual costume? Regardless, he owned it. Kudos. But the film picks up relatively soon after TASM1 left off. Considering I was with my niece who had failed to see the first one, her experience proved you didn’t need to see the first to enjoy the second, so that answers that question if you’re wondering if you need to see the first. However, I’d still highly recommend seeing the first, as Sony is about to have their own Marvel Universe, albeit with only Spider-Man and his rogues gallery of colorful villains. Anyway, we find Spider-Man doing his thing, enjoying being Spider-Man and enjoying the company of his lady friend Gwen Stacy. The point strongly made clear is the promise Peter Parker made to Gwen’s father about keeping away from her due to the dangerous life he leads as being a superhero. It’s sad and haunting. Actually, this outing hits a lot of emotional tones throughout the story as we dive deeper into returning characters, meet new ones, and watch them interact with one another. Harry Osborn comes to town. Max Dillon is a forgotten man. A crazy guy played by Paul Giamatti goes crazy. Okay, he plays Rhino. But he goes crazy. I at first was worried we’d be bombarded with too many people to keep track of, but it really wasn’t that bad as they were introduced in a somewhat seamlessly way, and immediately continued to drive the story along. And pace, of course, is important with a film like this. I loved the effects, especially the moments we slow down to see the fighting scenes. I will agree with other reviewers that there are more quips and jokes that are flung around which makes this definitely more fun despite how serious and dangerous things tend to get. There is A LOT going on. And the film moves quickly when it needs to as well as slows down for the more dramatic scenes, usually involving Peter dealing with family and matters of the heart. 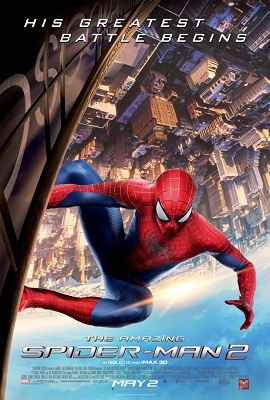 I’d say that there is the main plot, and perhaps 3 subplots… as Gwen is dealing with a major life change, Harry is adjusting to his new life back at home, and Peter further investigates the disappearance of his parents much to the chagrin of Aunt May, whom he is hiding a lot of stuff from anyway. The main plot, of course, deal with Max Dillon, later known as Electro, and his struggle to be seen. No, respected. Shout out to Jamie Foxx because at one point I felt he accidentally channeled a little Ray Charles. I can’t recall what scene, but it could have just been me. Besides that, it was pretty awesome anytime he was onscreen learn what kind of power he was capable of. I was also impressed at how one who is basically made of electricity would sound like. Also shout out to Emma Stone keeping it cutesy with Andrew Garfield as they shameless flirt onscreen so effortlessly that it gives you butterflies. I did not watch this in 3D. I’m sure it’s amazing, but I had just as much fun without it and I felt like saving some money. Also, the 3D showing was later and didn’t fit my schedule. However, it was a very family friendly movie, as was the first one. I couldn’t help but compare it to another recent Marvel hero’s outing Captain America: Winter Soldier which I failed to write a review for, I know. That was a great movie, but in comparison, that was geared more to an adult audience. TASM2 is more kid friendly, but adults shouldn’t be too disappointed either. Just don’t look for anything as sophisticated as Winter Soldier. Both films are highly entertaining and second viewings would be encouraged. It’s no secret that sequels and spin-offs are in the works, and this film is the launching pad for that, as evidenced is a few key scenes also near the end as well as the end credit sequence… which leads me to that… I had heard that viewers are to Shazam the first song played during the end credits, Kendrick Lamar and Alicia Keys perform as we see names and graphics in the background. Shazam is a song finding app, by the way. As of right now, it’s not worth doing Shazaming at the movie. All you’ll see is that scene again but without the names and focusing more on the graphics so you can see the plans for the Sinister Six. THEN there’s the scene from the upcoming X-Men film. All you need to know is that this scene has absolutely nothing to do with the Spider-Man universe as these two films are owned by different studios. After that scene is over, you can leave as there are no additional scenes. I won’t write spoilers here, but those who are familiar with the comics are aware of certain plot points that define Spider-Man’s trajectory in life, and it’s a major thing that does happen around the end of this film. At the time of writing this, I wanted to go to Wikipedia and correct a technical error about said spoiler, but hopefully someone will get around to editing that. Scroll down for the spoiler if you’d like to read it, but go see it in theaters! Gwen Stacy falls and Spider-Man catches her with his webbing, but because of where his webbing grabs her, how fast she was falling, and his abrupt stop, he breaks her back/neck with an unsettling crack… This also happens in the comics.